A TV debate would solve nothing, and claims about “the will of the people” are vapid. We need to find a way to hold a meaningful debate. Screenshot: the seven-way BBC election debate, May 2017. YouTube. Meanwhile, the real debate with which Theresa May has not engaged during her lonely tour of duty in one-way persuasion, is surely the one at the heart of a liberal democracy: democratic debate leading to compromise between legitimate political adversaries. Setting aside her preference for conducting the Brexit process as a secretive Whitehall operation, everything May has done since inheriting the binary referendum result on the UK’s future relationship to the EU has been an avoidance of debate, from the resistance of the UK government to seeking parliamentary approval for Article 50 or to a “meaningful debate” on the final deal, to the ministerial power grab over the Withdrawal Bill and secretive plans for trade deals, the marginalisation of the devolved nations, the refusal of plan-B discussions, and the insistence that “Brexit means Brexit” through months and years in which it has become increasingly clear that no-one really knows what Brexit means. Today, May’s ‘triple defeat’ by Parliament has elicited a warning from the leading Brexit-backing cabinet minister, Liam Fox, that Remainer MPs are trying to “steal Brexit from the British people” which he describes as a “democratic affront”. But the truth is that MP’s supporting the legal action in Luxembourg, like Caroline Lucas and Chris Bryant, in their campaign for a second referendum, have been fighting a valiant battle against the odds and May's Government, to give the British people a say. Under the desert conditions for democracy created by those conducting the Brexit negotiations, they are the ones who have insisted on keeping some sort of public space open and ticking. Bryant’s response to the legal advice was to express the hope that the final say on Brexit would be handed back to the public, “because only the people of the United Kingdom can sort this out.” It is being argued that the advocate general’s opinion, by the same token, gives the EU every reason to extend Article 50 for such an outcome, since a choice to remain made by the people might well be considered a stronger mandate than a decision to remain made by MPs alone. But whether Brexit is to be stolen from the British people or sorted out by them, the invocation of a unitary people’s will in both cases should raise alarm bells. Just how should a large and diverse, not to mention increasingly polarised people 'change its mind' or 'have a say'? Albert Weale’s pithy answer to the question, "Can 'a people' have 'a will' "? is decisively in the negative – “There is no singular will of the people emerging from a plurality of people… There is no one super-individual – the people – that has changed its mind… There is no will of the people independently of the rules used to combine different opinions”. He reminds us that a people does not change its mind, but that in a democracy, under a set of rules chosen in a decision that is supremely political, people do. Whatever the outcome to the roller coaster on which we are now riding and even at this late and bewildering stage, we can only begin to “take back control” to the extent that our voices can finally be heard in a way that can persuade and effect meaningful change. The question, for both Parliament and people, is what is a “meaningful debate”? All selective versions of a Brexit debate proliferate enemy images. We see only too well the cumulative dehumanising impact on ‘migrants’ when they are only ever spoken about, and, in the Windrush case for example, how shocking the effect when we finally hear directly from them. The speed at which “Europeans” began to be sucked into the “hostile environment” for migrants created by Theresa May as home secretary came as another, more recent shock. 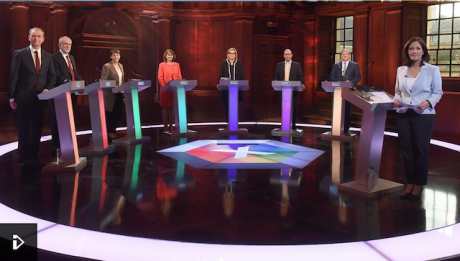 Don’t we need a debate that can “out”, identify and encompass all these points of view, one that brings Leavers and Remainers, ordinary and elite, face to face across all the boundaries and borders so far erected by the multiple toxic polarisations of the issue? This would be a public debate at least as ambitious and inclusive as the Scottish referendum debate was at its best. One that included the 16 to 18 year olds who were included in that process, and not in the EU referendum, on the grounds that this is their future we are talking about. A debate that welcomes the voices of the many migrants and fellow-Europeans in our midst, elite and ordinary as well. But above all, voices open to each other in all their diversity, willing to listen, even to care, and yes, even to change their minds. What is a 'meaningful debate' ? But it took Gordon Brown, as former UK prime minister, to go further in thinking about what is needed over and above any second public vote or even beyond a general election, if we are to have a democratic Brexit process at last. Divisions could “merely worsen” in an already “bitterly divided country”, since “at least two and possibly many more years of acrimonious EU negotiations still lie ahead”, he warned, ("To calm the Brexit storm, we must listen to the UK’s views again", Financial Times,16 November). Brown proposes the creation of a “new kind of royal commission” in order to be credible, authoritative and impartial. But I would argue instead for parliamentarians to become joint custodians of this new politics of persuasion in a constitution that devolved their most precious function to the citizens ­– what Albert Weale calls the “institutionalised debate in which competing views are expressed within a set of rules”. Citizens already have voices in ways without parallel before the internet era. Becoming the guarantors and enablers of such an inclusive, pluralist debate could be the best way to rescue democratic representation from its ‘gatekeeping’ crisis, with a useful knock-on effect on an overweening media. Gordon Brown’s choice of subjects for his debating platform, ought he thinks to “particularly examine those contentious issues where the situation has changed significantly since 2016”, citing both “national identity” and freedom of movement. Yet if Brown acknowledges the evidence of shifting opinions on the latter, Theresa May certainly does not. We learn that she rejects any Norway-style compromise deal with the Labour party. Why? On the grounds that ending freedom of movement is the hardest of the prime minister’s red lines. Again why? – we don’t know. Maybe it is for the same reason that Kramp-Karrenbauer, hailed as the most Merkel-like of her successor candidates, has announced that she would be much “stricter” on migration than Merkel. But can’t we do better than that? Couldn’t we hope instead, taking inspiration from Ada Colau’s PAH movement, that one advantage of a People’s Debate over a People’s Vote is the chance to include non-citizen residents and non-residents in this inclusive, empowering national debate? And that those pluralist encounters might similarly lead in a mutually enabling direction? If this is what is needed then one way not to frame that People’s Debate is highlighted by the interesting spat that recently broke out on openDemocracy among other places, between academics protesting at a panel debate billed for December 6 by Claire Fox’s Academy of Ideas and UnHerd. A dialectical process is one in which both sides cross boundaries, and a third term emerges which goes beyond them, into new territory. It's certainly what is needed. But how exactly can this take place? With polling indicating a widening gulf between Remain voters determined to ‘stop Brexit’ and Leave voters reconciling themselves to crashing out, what can stop this runaway process of polarisation? Some of us have been asking this for some time. On openDemocracy the indefatigable journalists, Adam Ramsay, Peter Geoghegan and others, who have for many months been investigating questions about the funding and the political influences behind the Leave campaigns, have recently secured the grim satisfaction of the Electoral Commission belatedly referring Aaron Banks to the National Crime Agency for investigation. Whatever the outcome – and Laura Kuenssberg told us on the same day that this was “unlikely to affect the Brexit process” – it is precisely at this point that we need to remind ourselves of the article Adam Ramsay wrote a year ago, to say, “Remainers: don’t use our investigations as an excuse”– an excuse, that is, not to ask much deeper questions about why they lost the EU referendum to 17 million voters in the first place. Is an answer to be found in Goodwin and Eatwell’s accounts of National Populism. Or might they instead give us just what we need to frame our inclusive, national, People’s Debate on Brexit and migration? ‘National populism’ – what is going on? James Meek in the October 11 issue of the LRB had raised his own concerns over Goodwin’s framing of the Brexit debate. Pointing out that his reading of Brexit tended to oppose “ordinary Leave voters against an arrogant Remainer elite as if those were the two sides at issue”, Meek argued that in doing this, Goodwin not only overlooked, “ordinary Remain voters, many of whom, though typically younger and better educated, feel as powerless, angry and betrayed as their counterparts on the other side”, but also ignored “an arrogant Leave elite, the Brexiteers”. Every day brings further revelations about their motivation, role and reach at work in British politics and its decision-making processes. Surely, for example, it is important for the British public, and not them alone, to be alert to the foreign and domestic backers of Tommy Robinson as well as to his plans? But looking more closely at Goodwin’s argument in UnHerd, there is one additional strand in his framing of the Brexit debate here which sure enough leads him inexorably to “Diversity [as] a Threat”, despite the fact that as a filter, it can only be self-defeating with regard to the very “deliberation and input from across society” which Goodwin and Eatwell seek. It is an argument that by the same token plunges us back into the increasingly stark choice of our times between horizontal empowerment and the monocultural National Us with which my argument began. “In a diploma democracy the well-educated voice resonates much more strongly at the ballot box; in deliberative sessions and expert meetings; in parliaments and cabinets”. There are many reasons why political representation is in crisis today, and an inability to serve the common good must be a dominant factor. But can a cosmopolitan tendency really bear the explanatory weight that it is given here? It is a convenient descriptive, to be sure, since a sense of relative ease with ‘the other’ is perhaps the sole factor seeming to unite the advantage of EU membership with further European integration, welcoming refugees and being happy to live side by side with people of the Muslim faith. Moreover, in itself, the consequent willingness to accept change provides a ready if not obviously irresponsible point of contrast to the “socially conservative views” that Eatwell informs us are “common” among national populist supporters and “deeply held”. However, for researchers so alert to homogenising biases and stereotypes, this choice of unifying trait seems hasty, if only and in particular because everything we might assume about the self-serving nature of political élites today suggests a marked inability to empathise with another ‘other’ – namely the very people whom Goodwin and Eatwell have committed themselves to understanding, caring about and empowering. Why draw the ‘cosmopolitan’ line at them? The Road to Somewhere, as Jon Bloomfield points out in his highly critical openDemocracy review, relies on a similar “mixture of selective facts and figures” to construct Goodhart’s particular version of a divided society, in which the working class is pitted against an “Anywheres” category that lumps together “everyone from those who go on to do low grade office and administrative work through to hedge fund managers and senior executives” via three years at university which are “apparently sufficiently formative to mould all these diverse people into one homogenous bloc”. Here too, an “unbridgeable gulf between the working and professional classes” takes centre stage, moving neoliberal globalisation, financial crisis, the concerted austerity drive and forty years of changing attitudes conveniently to one side, while it invokes a timeless “bedrock” and yes, the unitary National Us. Here too Jon Bloomfield finds the far right being treated with “kid gloves” in the process. Goodwin and Eatwell are eager to abjure words such as ‘racist’ or ‘fascist’ to describe UKIP members, the far right and populism in general, though they may not have anticipated UKIP’s most recent ‘metamorphosis into an outright, unapologetic far-right party’ at the advice of the Bannonite ‘Tommy Robinson’, now explicitly aiming to head up an aggrieved majoritarian movement in response to what he calls the ‘Great Brexit Betrayal’. Goodhart, before them, had designated UKIP, Trump and Le Pen alike “decent populists”, arguing that “UKIP and the Front National have been dragged sharply to the left in recent years” and that Trump is no “white supremacist”. But the selective concern with some dangers and not with others is not the only problem with this approach. When it comes to democratic debate, foregrounding “pluralist heaven” as a no-go-area can only lead to a series of missed opportunities. In his attempt to persuade us that “the vast majority of British people are ‘balancers’ who recognise the rights of genuine asylum seekers and need for migration”, Eatwell is surely right to ask his readers not to assume that racism is at play among the “many voters” for whom immigration is indeed “a major concern” and to seek to understand what is. One example we are asked to give a sympathetic hearing to is that national populist supporters think immigrants “should be expected to assimilate into the dominant culture, which many people still strongly identify with (though their conceptions of Britishness often differ).” The closing qualification here is a mere aside, the postscript of a scrupulous researcher. But isn’t Eatwell neglecting a more interesting line of inquiry? Looked at another way, conceptions of Britishness in the plural pose challenging questions about how coherent the ‘dominant culture’ is in our ‘hyper-diverse’ modern societies; questions about who is to decide which Britishness should dominate; and about who decides, if at all, who should assimilate to what? Furthermore, if we admit that the plurality here is a reality and not a cosmopolitan indulgence, couldn’t this recognition precisely take us in the direction of a mutually vulnerable, inclusive debate, open to ‘the other’ – in which even migrants or Europeans might have something to contribute to our changing perceptions of who British people are? Eatwell, in fact, agrees. His article concludes with an “urgent” call for a serious “bottom-up” conversation about “a new and more inclusive conception of national identity” that can “combine old aspects of British identity with the new realities of migration and multicultural communities”. But much more effort goes into urging educated readers to understand assumptions about assimilation, than goes into exploring what it would take in a democracy to have such a serious conversation that could change people’s minds. Which brings us back to the whole question of ‘contact’. Goodwin and Eatwell are always worth reading, because their work contains so many of the relevant facts. Take for example, Goodwin’s scrupulous qualification to his proposal for “making greater use of local referendums”, that “Such initiatives would not necessarily halt populism, as countries like Switzerland with its long tradition of direct democracy show.” So what advance on local referenda is conducive to the “meaningful discussion among citizens about political reform” that Goodwin seeks, that might respond to the “lack of voice” and sense of “distant elites that united many Leave voters”? Turn your back on pluralist encounter, or fail to question “assimilation” and are you really helping anybody? Isn’t it at least worth wondering what would happen if we dropped the Somewhere: Anywhere binary, and thought instead about a deeply polarised but hugely diverse society, divided between people like the leavers and remainers brought together in the Citizens Assembly on Brexit in Manchester last September, who were relieved to hear each other out, able to change their minds, and honoured to have the opportunity to think about the interests of the country as a whole; and those who are determined neither to persuade or to be persuaded, for whom reliance on force of number, a strong man, crashing out of the EU, or failing these, the lurking possibility of violence, seem the only hope? If that is truer to the reality in which we live, as I believe, then a framing of debate that pits those who are privileged by dint of their sheer capacity for debate against those who are not, perversely leaves national populist supporters with little to fall back on but stubborn silence and a gathering sense of betrayal. Eatwell asks us not to “ignore the views of national populist voters who have relatively low levels of education, and are not greatly interested in politics” – fair enough as far as it goes. But in this reductive straitjacket of a stand-off, don’t we begin to ask ourselves what is cause and what is effect? Framing the immigration debate in a way that assumes assimilation is the name of the game can only exacerbate the unpreparedness and fears of people panicking at the prospect of further, disempowering change. “Brexit means Brexit” is such a counterproductive dictum of majority reassurance precisely because it promises that you won’t have to change your mind. “Stopping Brexit”, reversing it or getting it over and done with plays exactly to the same humiliations and sense of powerlessness. So why should people be interested in politics, or democracy, when it only offers further loss of control over their lives? Cas Mudde writes this week on this platform that, “Today, the far right has established itself at the center of European politics, while scholarship is predominantly “neutral”, although most scholars remain hostile to the far right itself (but increasingly sympathetic to its voters).” Unfortunately, it seems true that these scholars also prefer to dwell on our need to understand the “strong identification” of such voters with a non-existent or imaginary monocultural National Us, at a time when Tommy Robinson is busy inflating that balloon, by claiming that his far right will lead “the 52% who opted for leave in the referendum”. Aren’t we doing Robinson’s work for him, when we encourage people to ignore the diversity in their own ranks; when we reassure people that they don’t have to change their minds or take minority viewpoints into account; and when we create an enemy image out of the ‘other’?